I came across an awesome food site the other day, The Culinary Sherpas. What I instantly was in love with was their cooking videos. And to be totally honest, I also loved all the tattoos. The site isn't pretentious, or puffed up to sound ultra "foodie." Real people, real food, and you can really learn a lot if you pay attention. Check em out! 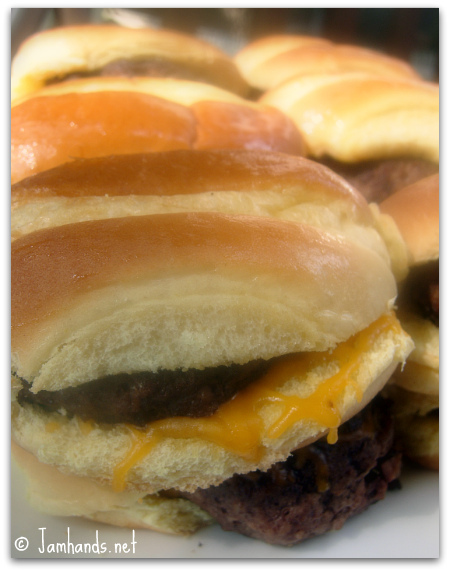 I watched a great video at The Culinary Sherpas featuring Crazy-Addictive Diner Sliders. They truly are addictive! 1. In a saute pan, over medium heat, add the canola oil and the onions. Saute the onions until just starting to brown, then set aside to cool. 2. Form the ground chuck into 12 equal sized balls and season with salt and pepper. 3. Heat a large cast iron skillet over medium heat (cast iron is non-negotiable) and place the balls into the skillet. You should hear a loud instant sizzle. If you do not, pull those bad boys back out and wait for the pan to be hot enough. 4. Top each ball with sauteed onion, season with salt and pepper, and mash the ball flat with a spatula. After 2 minutes, turn the sliders over preserving the onions as you flip, mash flat with the spatula and cook for 2 minutes longer. 5. Carefully remove the sliders from the skillet, so that you don’t lose the onions, and place inside of the potato rolls. YUM!! I recently found the Sherpas, too, and am loving their site! these sound delicious! have to put them on my list of things to try! Thanks for stopping by my blog. These look and smell delicious. Oh yes, I think I can smell them through the computer! I feel like a total ditz asking this, but where did this term "sliders" come from? and what rock was I under when they started calling mini hamburgers this?